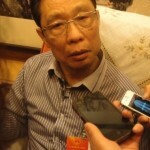 NPC Delegate Zhong Nanshan: What Good Is The World’s Highest GDP If The People Can’t Breathe? The latest art craze sweeping the Chinese Internet? Tree hollow paintings. 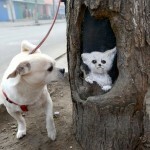 Netizens are going crazy for art student Wang Yue’s cutesy creations, painted in the hollows of trees lining a street in her hometown of Shijiazhuang. The story has been picked up by several mainstream news outlets, including CCTV News’ “Weiguan Tianxia” program, whose host Xu Zhuoyang called them “a touch of warmth in the midst of a cold winter.” Aww.